We are now leaving beautiful Saigon to go to Phu Quoc Island, a island in south Vietnam known to be idyllic! As we found a cheap flight from Saigon that takes only 45 minutes with Jetstart, we booked the ticket and went off for this piece of paradise on earth. We arrived in a charming hotel by the beach – The Beach Club hotel ! We could not asked for more, we had the foot in the sand on a beautiful beach and our bungalow behind us. This small hotel had a restaurant with good quality food. The highlights of this stop over before Cambodia are definitively the great beaches and the relaxing atmosphere. It is very easy to rent a motorbike and go discover the island. The traffic is low and the road paved and unpaved, depending where we are. We went to the Bai Sao beach which is a must see! It is located about 20 km from the town Duong Dong, which by the way doesn’t have much to offer. The north side is supposed to have nice beaches as well but we didn’t go as the roads are still being paved and conditions are not optimal. Since our next destination was Cambodia, Phu Quoc was also chosen because of the easiness to cross the border through Ha Tien into Cambodia. We read various blogs about it but it was very vague. 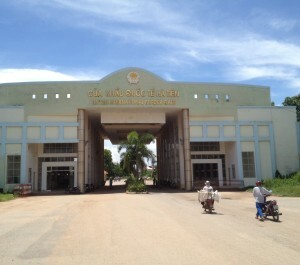 So we will give you the complete guide of crossing the Ha Tien border into Cambodia. We booked the whole transportation to Kampot in Phu Quoc. It included all transportation from Phu Quoc to Kampot for only $21 dollars each. It was the best decision as we read that there were no taxis, buses or pretty much no means of transportation once you cross the border. And this was certainly true, we didn’t see any Tuk Tuks either, basically just a minibus of people who had booked in advance. From Phu Quoc, a minibus picked us up from the hotel, took us to the ferry port. The ferry was very comfortable, air conditioned and provided water and wet towels. It took us about one hour and half to reach Ha Tien. Once we reached Ha Tien, there were tons of minibuses waiting to take people over the border. It was hard to figure out which minibus was the one we had to get into, but we asked some people and we could figure out which one was our mini bus company according to our receipt. The minibus took us to their office first where we were able to exchange dongs to dollars as we didn’t have enough for the visa fee. 30 minutes later, we left for the border. The ride on mini bus only took 15 minutes which then dropped us off right before the border. Another guide started walking with us showing us the way. The Vietnam side is the first step where they put an exist stamp in the passports. Then, we had to walk about 500 to 600 meters the Cambodian border came across. For now, it’s only three small houses, but they are building what seems to be a nice crossing border building. 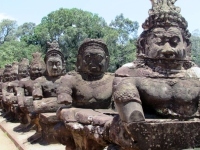 The Cambodian visa is available on arrival but can be done in advance. 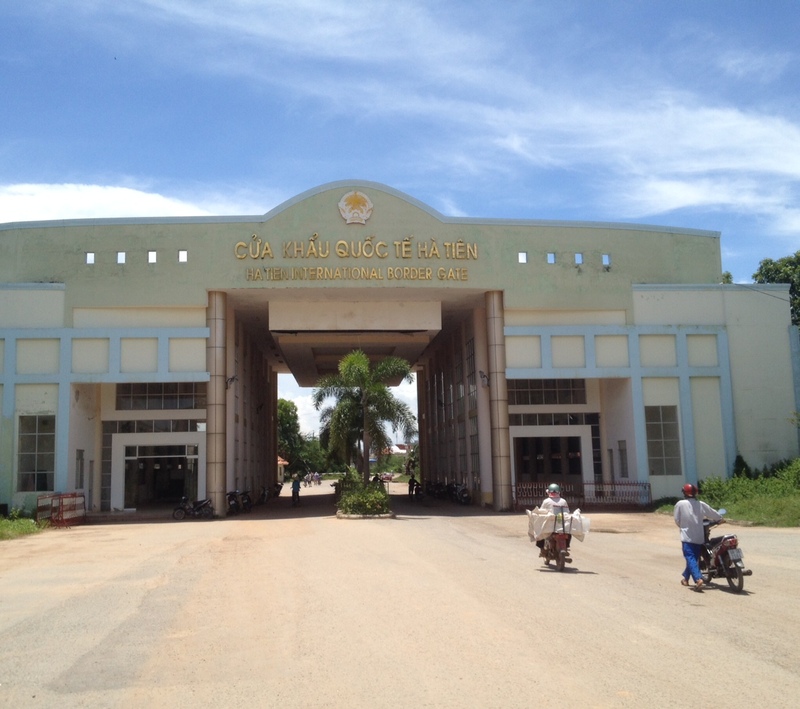 At the Cambodian border, we had to fill out 3 forms and pay $25 dollars for the visa with a recent passport photo. Then we got a pointless health check where a guy took our temperature with a “digital thermometer” on our forehead for $1 dollar. This is a scam for sure. Some people told us we could just say “no”. We didn’t but we still had to fill out a form there too. Then finally, we headed over an other side where they processed with our final visa entry and yet another form to fill out. It was quite an experience and we finally got to Kampot by tuk-tuk that took about 1 hour to reach this small village in south Cambodia. We can’t wait to discover a little more about this small country in the middle of east Asia !